For my daughter's twelfth birthday party, we gathered a bunch of her besties, some odds-and-ends from around the house, and as much verve as we could muster for an epic Minute-to-Win It style showdown. The player with the most points at the end of the morning, was deemed the winner! Scatter the dice on the playing surface. Hand a player a pair of chopsticks and a bowl. He must move each die from the playing surface to his bowl using only a pair of chopsticks. To make it slightly more difficult for older kids or teens, have the playing surface and the bowl in two separate locations. The player would then need to walk each die across the room or yard in order to deposit them all into his bowl. Any player who successfully gets all the dice into his bowl receives 5 points. Fill one of the paper plates with a handful of cotton balls and set it next to the other paper plate. The second paper plate should be empty. Put a dollop of petroleum jelly on each player's nose. 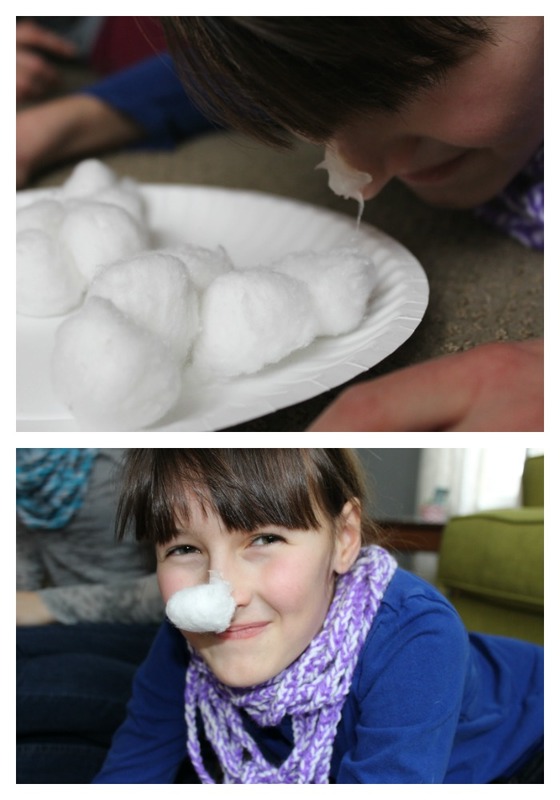 Each player must transfer all the cotton balls from one plate to the other using only her nose. The player who moves the most cotton balls in one minute wins 5 points. Give each player three inflated balloons. He must keep all of them floating in the air for the entire minute by swatting them upwards with only his hands. Should any of his balloons touch the ground or surrounding furniture, the player is disqualified and is only awarded one point for participation. Any player who can keep all three of his balloons suspended in the air for the entire minute receives all 5 points. Players may attempt to sabotage the balloons of the other players by knocking opponent's balloons out of reach. Blindfold a player. Set two empty bowls in front of her. Fill one bowl with a dozen cotton balls. Leave the other bowl empty. Instruct the player to put her non-dominant hand behind her back. Place the spoon in her dominant hand. The player then must transfer as many cotton balls from one bowl to the other using only the spoon. 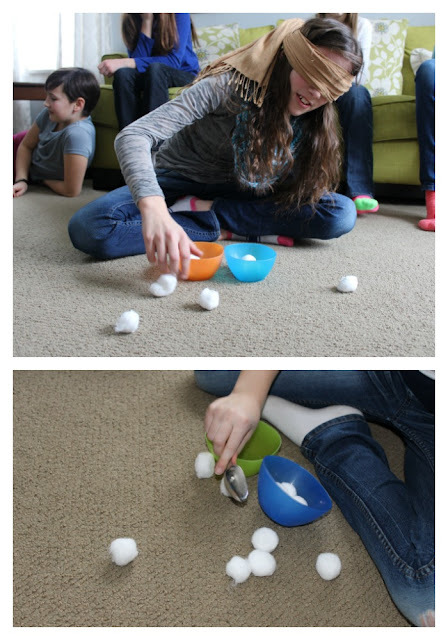 The player who can transfer the most cotton balls in one minute wins the game and is awarded 5 points. Scatter Legos® around the playing surface. Hand a cup and a drinking straw to a player. He must stab one of the Lego® studs (the raised bumps) with the end of his straw. This will allow him to pick up the Lego® brick and transfer it to the cup. The player must not touch the brick with any part of his body. The transfer has to be entirely done with the straw. The player with the most bricks in the cup at the end of one minute is awarded 5 points. 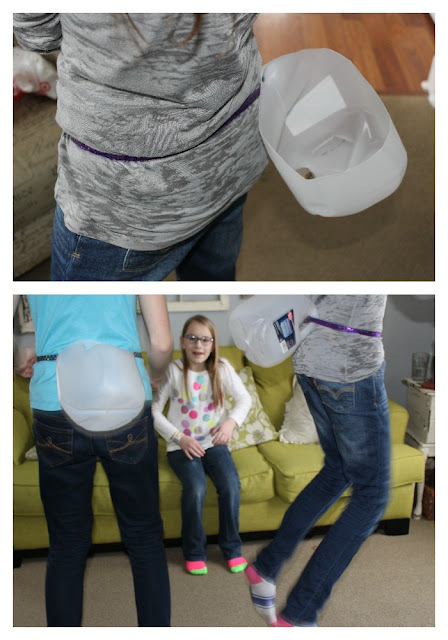 Loop the handle of the milk jug through the belt and wrap the belt around the waste of a player. The jug should be resting on her back. Put all the pennies into the jug. Instruct her to jump to get all the pennies to fall out of the jug. Any player who successfully bounces all of the pennies out of her jug earns 5 points. Instruct each player to put the handle side of a spoon into his mouth so that the bowl of the spoon is sticking out in front of his face. The player who can stack the tallest tower of dice onto the bowl of his spoon using only one hand in one minute wins. 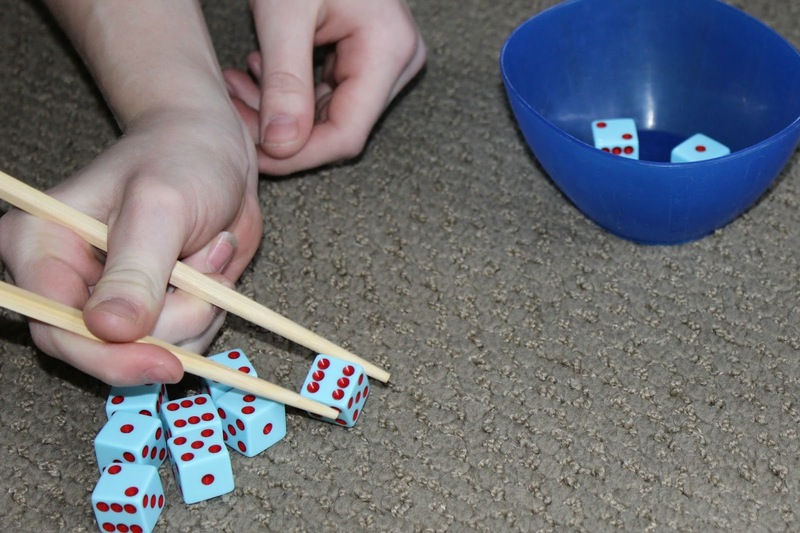 If a player's dice topple during the play time, he can begin stacking again and continue to do so until the minute is up. Stack 10 plastic cups into a pyramid on the floor. Put a tennis ball into one leg of the nylons. Place the waist side of the nylons onto the head of a player so that the leg side and tennis ball hangs freely down the side of her body. With her hands behind her back, each player must swing the tennis ball in order to knock over each plastic cup. To make it more difficult for older kids and teens, don't stack the cups into a pyramid. Instead, line them up in a single-file row. Each player who can successfully knock over all of the cups receives 5 points. Using the masking tape, mark a starting point and an ending point on the playing field. Place the tissue paper on the starting tape. Instruct the player to blow the paper across the playing field to the other piece of tape. To make it more difficult for older kids or teens, put other larger objects in the way so that the players must go around/over/under in order to reach the ending tape. Any player who can blow his paper across the ending point in one minute is awarded 5 points. Stack 10 cups on the floor to form a pyramid. 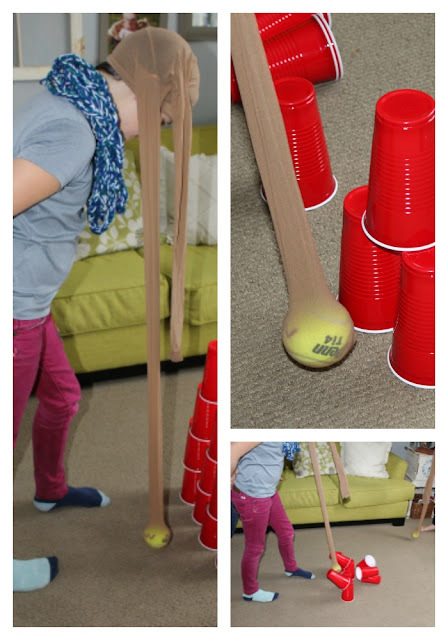 Each player must use the rubber bands to shoot and topple all of the cups. The player who topples the most cups in one minute wins 5 points. 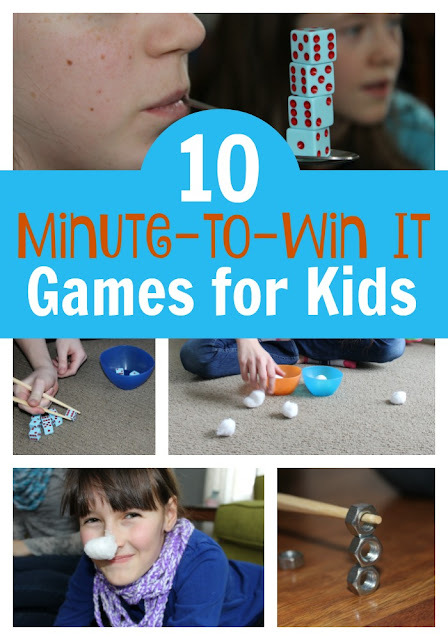 These fast-paced, frantic games along with her Book of Twelve made for a memorable last birthday of childhood. This is so fun!! My daughter’s 13th birthday is coming up & she’ll love all of these-thanks for taking the time to post (and with pictures-I need that more often than not :) )! I might even use these for all the kids on New Years Eve, so fun for all ages! These would be great for New Year's Eve!